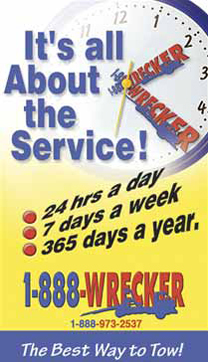 1-888-WRECKER has a comprehensive fleet of late model trucks. Capable of fullfilling your towing needs. We achieve this with meticulously maintained equipment, a top-notch staff of fully trained drivers, and courteous dispatchers and office personnel. Our commitment to total customer satisfaction is backed by full insurance coverage and our operations are computerized for ease of access and speed.